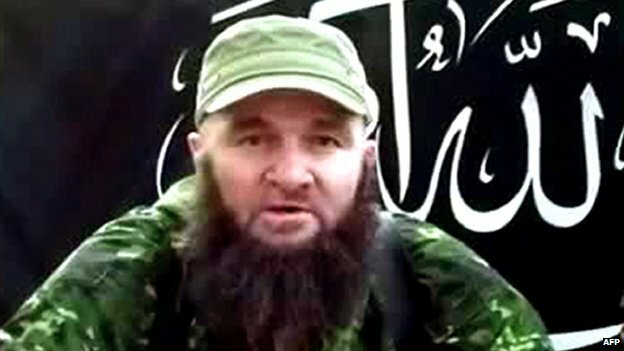 The leader of the Chechen rebels, Doku Umarov, has died, according to Kavkaz Center, the main website of Russia’s Islamist militants. The website said the Caucasus Emirate leader “became a martyr”, but no further details were given. There has been no official confirmation from the Russian authorities. The militant group has claimed responsibility for a string of deadly attacks in Russia in the last few years. A spokesman for Russia’s national anti-terrorism body was quoted by Russian state news agency RIA as saying he could not confirm Mr Umarov was dead, Reuters reports. The Kavkaz Center website wrote on its Twitter account that Ali Abu-Mukhammad had been chosen as the new emir by the Caucasus Emirate. The website is seen as sympathetic to Islamist militants fighting against Russian rule in the North Caucasus. In the past, it has used the line about “becoming a martyr” both for people who were killed and for Islamist militants who died of natural causes, so it is not clear if Doku Umarov died peacefully or if he was killed, says Artyom Liss, head of BBC Russian. Over the last few years, the Russian authorities have announced his killing several few times. He has often recorded video statements just days after his alleged killing by the Russian forces, our correspondent says. The self-styled emir of the Caucasus Emirate is one of Russia’s most wanted rebels. He has claimed to have ordered the January 2011 Moscow airport bombing that killed 36 people, and the March 2010 suicide bombings in the Moscow Metro, in which 39 people died. He is also said to have ordered the November 2009 bombing of a train from Moscow to St Petersburg that left 26 dead. Mr Umarov also urged his fighters to target the Winter Olympic Games, which recently took place in the Black Sea resort of Sochi. Russia has been battling Islamist insurgents, who are seeking to carve an emirate out of Russia’s mostly Muslim southern Caucasus provinces, for years.